The WS30T-WK 4", 2-way, white Cabinet Loudspeaker is part of Inter-M's WS Series, a full range of 100v line low impedance music speakers. This 30 Watt, full range music speaker combines compact, modern styling with high performance audio and is ideal for background music and voice installations in applications such as bars & restaurants, leisure centres, schools & colleges, gymnasiums, museums and boardrooms in both indoor and outdoor applications. The speaker has an Ingress protection of IP54. 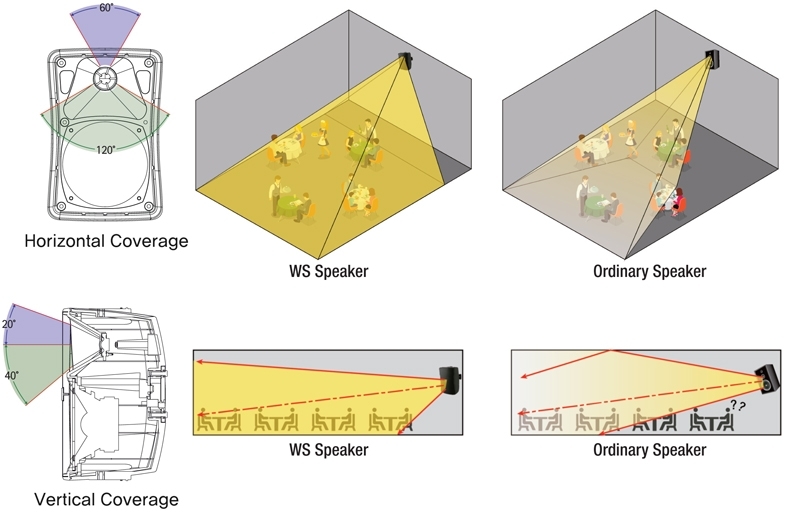 Covers large areas: The WS Series uses an asymetric horn design with 2-way mode which covers sound area perfectly. Professional Sound Quality: Applied HF and LF drivers to provide powerful high sounds without distortion. Water resistant IP54 rating: The 100v/70v line low impedance (8Ω) switch & IP54 rating enables users flexibility of use in indoor or outdoor applications. Easy to mount: The WS30T-WK is provided with a steel-made knuckle bracket for wall mouting and allows for vertical & horizontal position adjustment. Alternatively a steel U-bend bracket is required which may be purchased separately and has a 30 degree rotation up/down.